Altimeter Group is going to release a research paper on the Career Path of the Corporate Social Strategist, and this is subset data, sign up here to receive the upcoming report. These corporate social strategists (which I’ve segmented as companies with over 1000 employees) responded to find out how they are preparing their companies for social media. First, read these Five Ways how Companies Organize for Social Media, which many corporations are using as a model. To Respond to a Corporate Wide Culture Shift, Most Form “Hub and Spoke” model. 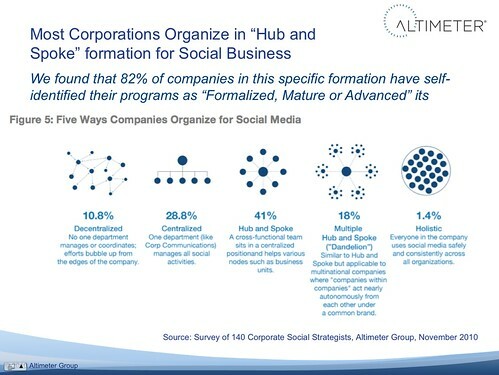 Most companies are currently formed in the hub and spoke formation in order to respond to the corporate wide impacts that social media brings. Secondly, 29% of companies are formed in centralized, a formation used for maintaining control. Hub and Spoke Provides Centralized Resources to Business Units. Corporations recognize that these technologies have impacted every single customer touchpoint both in and outside of the enterprise. As a result, there’s been a change within a company to respond and social media teams are evolving. Most commonly, companies launch a centralized cross functional group (often known as a Center of Excellence) in order to serve the various business units with a common set of services, templates, software, and knowledge. In the “Hub and Spoke” formation strategic decisions are still often made in corporate in the hub, with some guidance from the business units in the spokes. A majority of the brands I’m working with are in this model, having recently formed their hub they are starting to coordinate and I’m brought in to help formalize the program or convince management. Over Time, Expect Companies to organize in either Dandelion Holistic Formations. Overtime, social media will permeate all areas of the corporation and we should expect that the once centralized groups will slowly fade into the background as an operational status quo. As I track this space over the coming years, expect to see more companies transfer to the Multiple Hub and Spoke, which has been dubbed by Altimeter’s Christine Tran as “Dandelion”. In this phase, decision making about social media programs shifts to the business units and geographies in order to meet the specific needs of those communities. Dependent on a culture of ‘customer service’ some companies may evolve to the holistic formation where thousands of employees are operating in a safe way, much like Zappos and Best Buy’s Twelpforce program. In future blog posts, I’ll be discussing other aspects from our research, such as budgets, staffing size, organizational models over this coming next few weeks. Feel free to use this data in your slides and planning (this is Open Research), kindly just provide attribution to Altimeter Group. Please leave a comment, I’m curious to hear how your company is forming in this space –and why.